The inherent optical properties (IOPs) of a water body can serve as robust proxies for many important ecological and biogeochemical processes that are of fundamental importance to the Earth system. 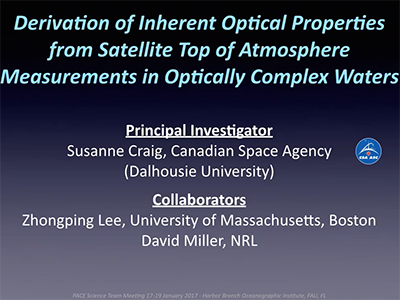 IOPs can be derived from measurements of satellite ocean color, and many successful derivation methods now exist, and provide a powerful means of synoptically monitoring these processes and their response to a changing climate. However, in waters such as the coastal ocean and inland water bodies, accurate retrieval of IOPs is often hampered by factors including difficulties in removing the contributions of the atmosphere from the satellite signal, and poor performance of standard ocean color algorithms due to the complex relationships amongst the water constituents. 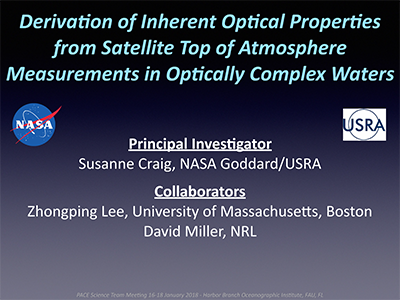 The objective of this project, therefore, is to develop an approach to derive accurate estimates of IOPs from top of atmosphere (TOA) satellite radiance, thereby bypassing the difficulties often associated with atmospheric correction procedures. This is of particular relevance to coastal and inland water bodies where retrieval of robust ocean color products is notoriously challenging, and is frequently hampered by difficulties in achieving accurate atmospheric correction. The approach may be used for all waters, but most importantly, offers a means to accurately estimate IOPs from ocean color in scenarios where it may otherwise not be possible. The proposed objectives will be achieved using an approach already proven for both in situ hyperspectral and satellite multispectral measurements. Using a combination of existing satellite and aircraft hyperspectral ocean color measurements and a custom generated TOA synthetic dataset, we will perform rigorous statistical model evaluation, sensitivity analyses to investigate variable oceanic and atmospheric effects on model skill, and finally, will develop operational implementation strategies. These activities will allow the model to be fully developed for hyperspectral TOA applications and a determination of the best model type - regional, water type or global. The end product will be a set of methodologies to provide an accurate means of deriving hyperspectral IOPs in the most challenging scenarios and will represent a significant advance in our ability to fully exploit remote sensing of the planets most important and vulnerable water bodies. 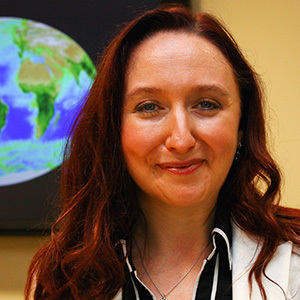 The proposed research directly addresses the requirements of the PACE mission to achieve accurate hyperspectral IOP estimates, and insight into the processes for which they are proxies, in critical coastal ocean and inland water bodies - areas particularly susceptible to the impacts of climate change and anthropogenic perturbation. This is entirely in keeping with the broader NASA Earth Science Research Program to acquire new insights into the Earth system. Walker, S.A., Azetsu-Scott, K., Normandeau, C., Kelley, D.E., Friedrich, R., Newton, R., Schlosser, P., McKay, J.L., Abdi, W., Kerrigan, E., Craig, S.E., and Wallace, D.W.R. (2015). Oxygen Isotope Measurements of Seawater (H218O/ H216O): A Comparison of Cavity Ring-Down Spectroscopy (CRDS) and Isotope Ratio Mass Spectrometry (IRMS), Limnol. Oceanogr. Methods, 14(1), 31-38, doi: 10.1002/lom3.10067. Mouw, C.B., Greb, S., Aurin, D., DiGiacomo, P., Lee, Z., Twardowski, M., Binding, C. Hu, C., Ma, R., Moore, T., Moses, W., and Craig, S.E. (2015). Aquatic Color Radiometry Remote Sensing of Coastal and Inland Waters: Challenges and Recommendations for Future Satellite Missions, Remote Sens. Environ., 160, 15-30, doi: 10.1016/j.rse.2015.02.001. Jones, C.T., Craig, S.E., Barnett, A.B., MacIntyre, H.L., and Cullen, J.J. (2014). Curvature In Models Of The Photosynthesis-Irradiance Response, J. Phycol., 50(2), 341-355, doi: 10.1111/jpy.12164. Georges, A.A., El-Swais, H., Craig, S.E., Li, W.K.W., and Walsh, D.A. (2014). Metaproteomic Analysis of a Winter to Spring Succession in Coastal Northwest Atlantic Ocean Microbial Plankton, ISME J., 8, 1301-1313, doi: 10.1038/ismej.2013.234. Barnes, B.B., Hu, C., Cannizzaro, J.P., Craig, S.E., Hallock, P., Jones, D.L., Lehrter, J.C., Melo, N., Schaeffer, B.A., and Zepp, R. (2014). Estimation of Diffuse Attenuation of Ultraviolet Light in Optically Shallow Florida Keys Waters from MODIS Measurements, Remote Sens. Environ., 140, 519-532, doi:10.1016/j.rse.2013.09.024. Craig, S.E., Thomas, H., Jones, C.T., Li, W.K.W., Greenan, B.J.W., Shadwick, E.H., and Burt, W.J. (2013). Temperature and Phytoplankton Cell Size Regulate Carbon Uptake and Carbon Overconsumption in the Ocean, Biogeosciences Discuss., 10, 11255-11282, doi:10.5194/bgd-10-11255-2013. Teather, K., Hogan, N., Critchley, K., Gibson, M., Craig S.E., and Hill, J. (2013). Examining the Links Between Air Quality, Climate Change and Respiratory Health in Qatar, Avicenna, 9, doi: 10.5339/avi.2013.9. Schmidt, A.L., Wysmyk, J.K.C., Craig, S.E., and Lotze, H.K. (2012). Regional-Scale Effects of Eutrophication on Ecosystem Structure and Services of Seagrass Beds, Limnol. Oceanogr., 57(5), 1389-1402, doi: 10.4319/lo.2012.57.5.1389. Thomas, H. Craig, S.E., Greenan, B J. W., Burt, W., Herndl, G.J., Higginson, S., Salt, L., Shadwick, E.H., and Urrego-Blanco, J. (2012). Direct Observations of Diel Biological CO2 Fixation on the Scotian Shelf, Northwestern Atlantic Ocean, Biogeosciences, 9(6), 2301-2309, doi: 10.5194/bg-9-2301-2012. 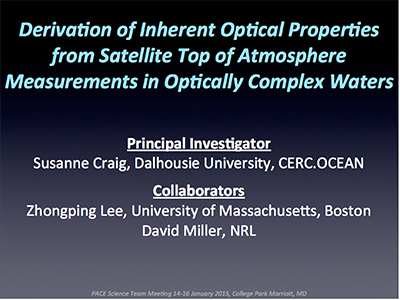 Craig, S.E., Jones, C.T., Li, W.K.W., Lazin, G., Horne, E., Caverhill, C., and Cullen, J.J. (2012). 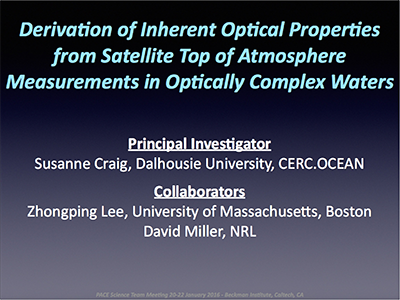 Deriving Optical Metrics of Ecological Variability from Measurements of Coastal Ocean Colour, Remote Sens. Environ., 119, 72-83, doi: 10.1016/j.rse.2011.12.007. Gibson, M.D., Heal, M.R., Bache, D.H., Hursthouse, A.S., Beverland, I.J., Craig, S.E., Clark, C.F., Jackson. M.H., Guernsey, J., and Jones, C. (2012). Using Mass Reconstruction Along a Four-Site Transect as a Method to Interpret PM10 in West-Central Scotland, UK, J. Air Waste Manag. Assoc., 59(12), 1429-1436, doi: 10.3155/1047-3289.59.12.1429. Shadwick, E.H., Thomas, H., Comeau, A., Craig, S.E., Hunt, C.W., and Salisbury, J.E. (2010). Air-Sea Fluxes on the Scotian Shelf: Seasonal to Multi-Annual Variability, Biogeosciences, 7, 3851-3867, doi:10.5194/bg-7-3851-2010. Craig, S.E., Lohrenz, S.E., Lee, Z.P., Mahoney, K.L., Kirkpatrick, G.J., Schofield, O.M., and Steward, R.G. (2006). Use of Hyperspectral Remote Sensing for the Detection and Assessment of the Harmful Alga, Karenia Brevis, Appl. Opt., 45(21), 5414-5425, doi: 10.1364/AO.45.005414. Cunningham, A., McKee, D., Craig, S.E., Tarran G., and Widdicombe, C. (2003). Fine-Scale Spatial Variability in Phytoplankton Community Structure and Inherent Optical Properties Measured from an Autonomous Underwater Vehicle, J. Marine Syst., 43(1-2), 51-59, doi: 10.1016/S0924-7963(03)00088-5. McKee, D., Cunningham, A., and Craig, S.E. (2003). Semi-Empirical Correction Algorithm for AC-9 Measurements in a Coccolithophore Bloom, Appl. Opt., 42(21), 4369-4374, doi: 10.1364/AO.42.004369. McKee, D., Cunningham, A., and Craig, S.E. (2003). Estimation of Absorption and Backscattering Coefficients from In Situ Radiometric Measurements: Theory and Validation in Case II Waters, Appl. Opt., 42(15), 2804-2810, doi: 10.1364/AO.42.002804.